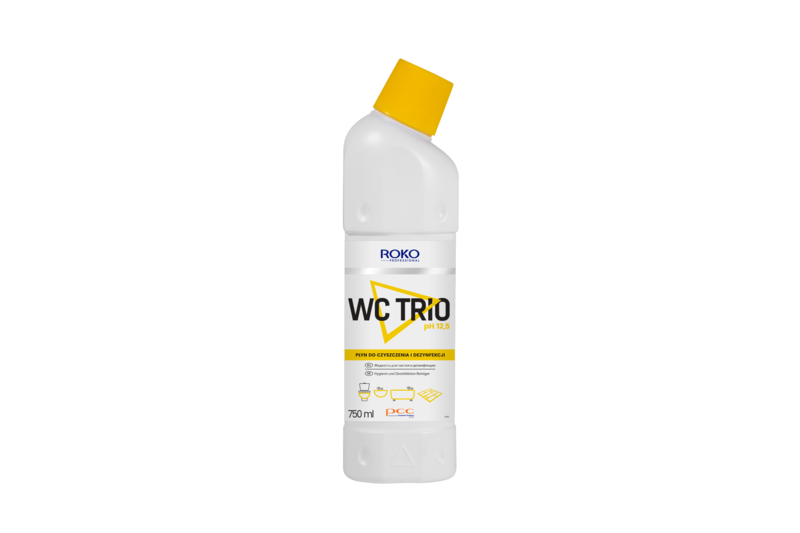 ROKO PROFESSIONAL WC TRIO is a concentrated preparation intended for cleaning, disinfecting and bleaching. It is perfect for toilet bowls, urinals, baths, washbasins, tiles and joints. Do not use on wooden, metal (chrome-plated, etc. ), enamelled, varnished surfaces. Do not use on silk, wool as well as coloured, artificial and delicate fabrics. Always follow instructions of clothing, material and equipment manufacturers. Do not pour on furniture or carpets in order to avoid their damage. It perfectly washes and disinfects, effectively fights fungi, bacteria, viruses, mycobacteria, and it is perfect for bleaching. According to the positive opinion of the National Institute of Hygiene, the WC Trio can be used as a disinfectant in Health Care Centres. Ministry of Health permit no 2148/05, active substance (max. 4.5 g / 100 g of active chlorine). The product is intended for professional use. cleaning disinfecting bleaching washing toilet bowls washing urinals washing baths washing washbasins washing tiles washing joints health care centres.